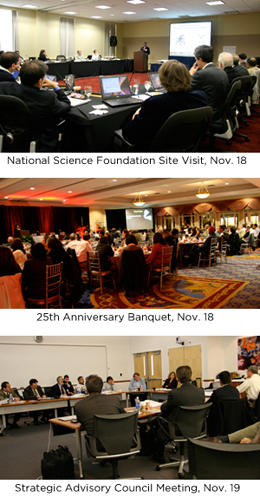 ISR hosted a site visit by the National Science Foundation from Nov. 17–18. Prior to the event, ISR faculty and staff prepared a 36-page report covering the institute's scientific achievements and impact, influence as a model for academic research, strategic planning, industry collaboration and technology transfer, education program, infrastructure, and sustainability post ERC-graduation. The site visit team viewed a poster session by ISR faculty. Each faculty member's poster depicted their most important research during their time at ISR. The team also met privately with ISR joint-appointment faculty, department chairs and the dean before preparing a report covering their impressions of ISR's post-graduation trajectory, and their suggestions for ISR's future directions. "Keynote talk: Flight and Targeting Characteristics of Echolocating Bats" by Cynthia Moss, Institute for Systems Research and Department of Psychology, followed by a panel discussion featuring Moss; P. S. Krishnaprasad, Institute for Systems Research and Department of Electrical and Computer Engineering; and Timothy Horiuchi, Institute for Systems Research and Department of Electrical and Computer Engineering. ISR's Strategic Advisory Council (SAC) met with ISR joint faculty and staff on the morning of Nov 19, giving their impressions of the information presented in the NSF Site Visit (at which they were guests). The SAC is made up of industry and academic representatives who convene on a regular basis to advise ISR on future directions. Specific advice for ISR was offered and discussed at this meeting.